Emily Jutras scores the winning run for Triton in the 7th. 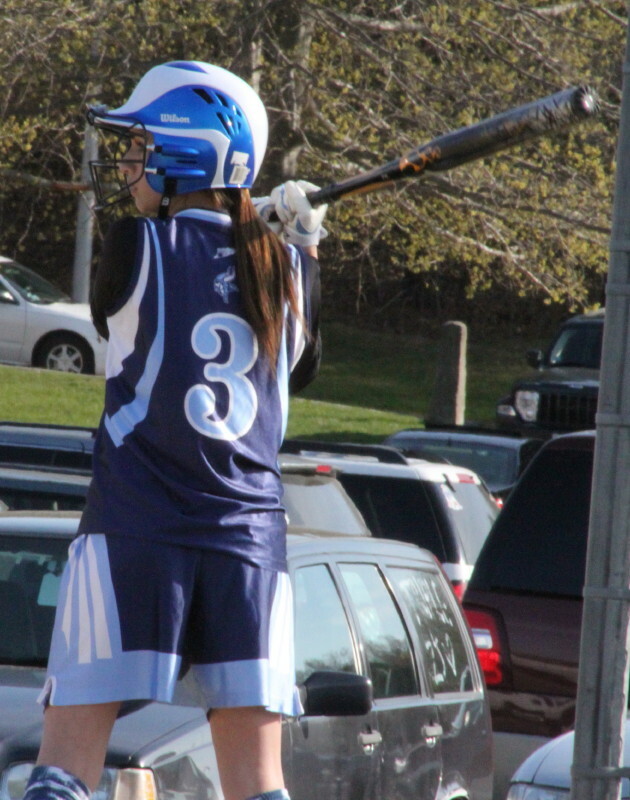 Jenn Delaney delivered the game winner for Triton. 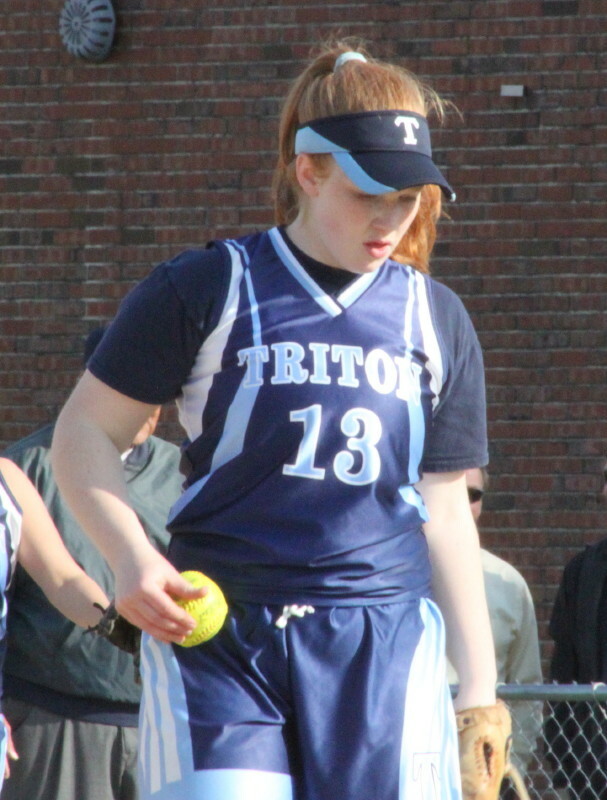 (Byfield) Triton (4-6) rallied for four runs in the bottom of the seventh to edge Georgetown, 5-4, in Cape Ann League softball action on Monday afternoon. This is a game that Georgetown (2-3), as a team, won’t remember fondly and I dare say pitcher Sarah Erlandson would rather forget even more so. Sarah took over for her sister Jane in the bottom of the fifth in a 1-1 game. 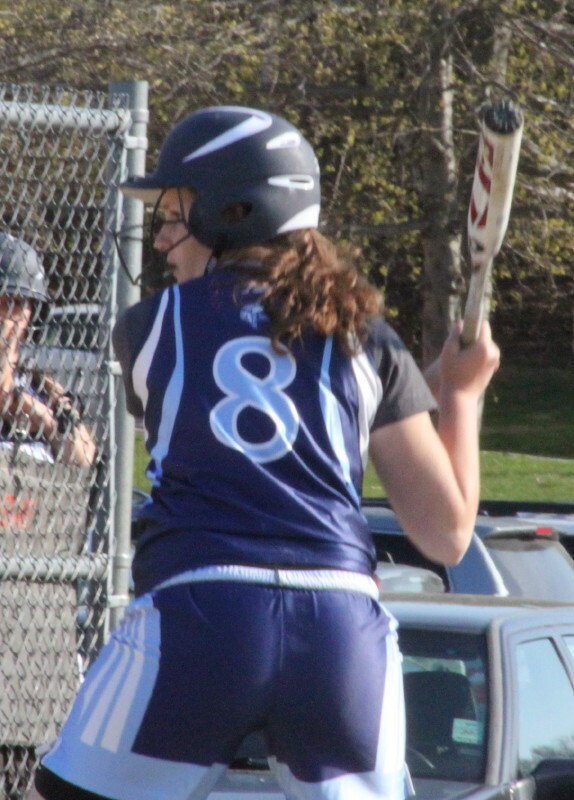 The talented senior survived a three-walk fifth with three K’s and then helped her team grab a 3-run lead (4-1) in the top of sixth with an RBI single. Sarah had more trouble finding the strike zone in the bottom of the six and issued three more free passes. She escaped unscathed for the second straight inning because of Viking miscues on the bases. First, catcher Taylor Nelson gunned down Marion Dullea trying to get to third on a wild pitch. Then Kylie Gilroy fell victim to the look back rule after walking and Sarah struck out Jenn Delaney to end that promising inning for Triton. Unfortunately for Georgetown, the strike zone continued to elude the Royals’ pitcher in the seventh and this time there was no escape. Three of the first four batters received walks and Emily Jutras drove in two of them with a double to center. Another walk loaded the bases with two outs and then Kylie Gilroy walked to force in Brooke Jamison from third to tie the score. That set the stage for Jenn Delaney, who had struck out to end the sixth, to stroke a hit to left and score Emily with the winning run. Marion Dullea pitched a complete game. 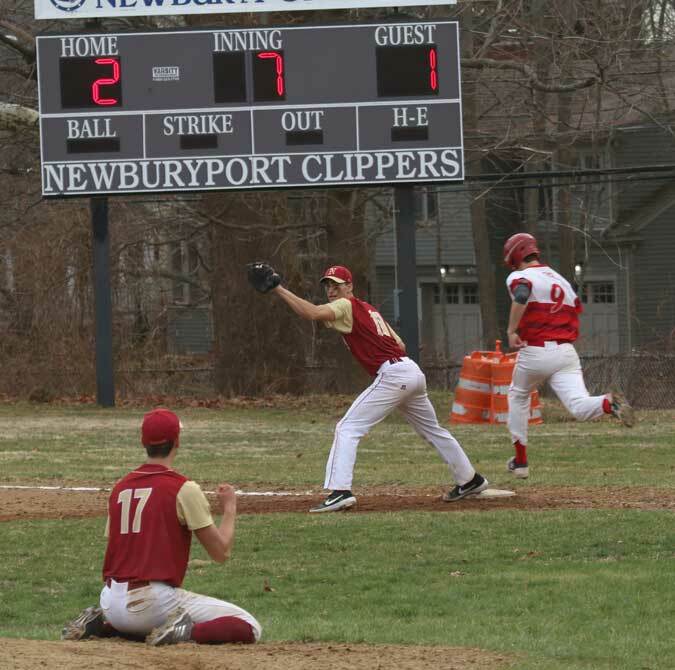 Winning pitcher Marion Dullea retired the last six batters in a row after giving up three runs in the 6th. She gave up six hits to go with five strikeouts and just one walk. 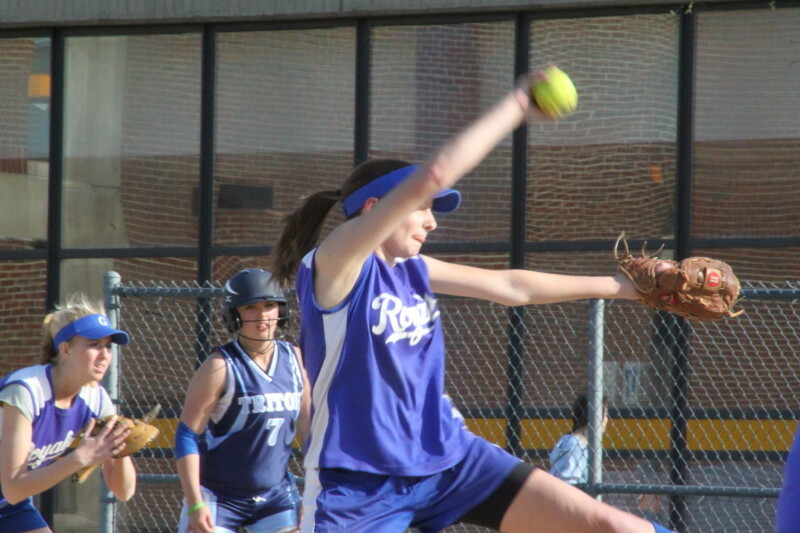 Jane Erlandson pitched her first four innings this season for the varsity. The sophomore allowed three hits and one walk to go with three strikeouts. She is not as fast as her sister but on this day had much better control. Georgetown picked up a run in the first on a couple of hits including Taylor Nelson’s single to left that drove in Kassie Barba. 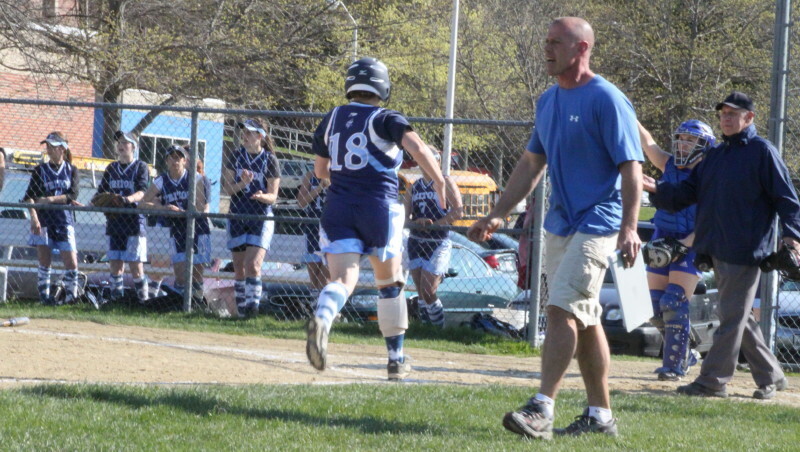 Triton’s solo run (in the 4th) was driven in by Vanessa Eisen. Emily Jutras was the run scorer. She had singled and stolen second before Vanessa’s hit to left. 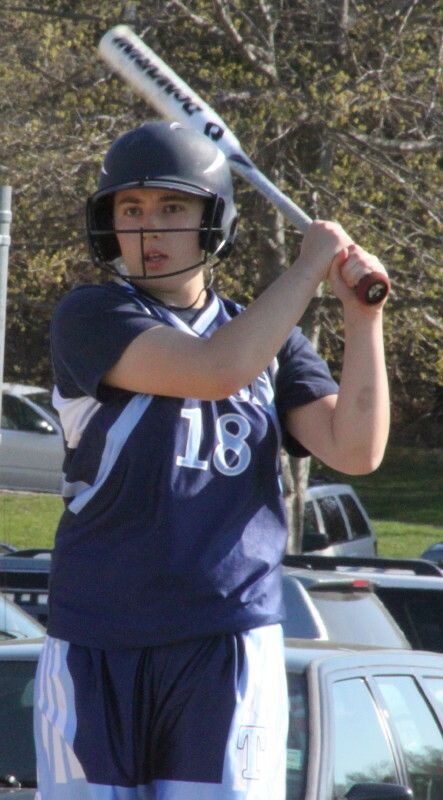 Both Sarah Erlandson and Emily Jutras led their team’s with two hits each.